← Le Carillon National, Ah! ça ira and the Downfall of Paris. When I picked up my badge at the registration desk of the 2011 Percussive Arts Society International Convention, there was a green ‘Presider” ribbon, my first ever. As a presider it was my privilege to introduce the first ever Drummers Heritage Concert Event, the first in what would be a series of annual Heritage Events. Presiding was a privilege because it was the desire of more than 220 field drummers, fifers and pipers who participated in the 1st Drummers Heritage Concert in Columbus, Ohio in 2002, for all future proceeds attending the concert and their performances to be put into a fund to support Drummers Heritage events. Within a few years of that concert, The Historic Drummers Heritage Concert DVD was completed and put on sale. 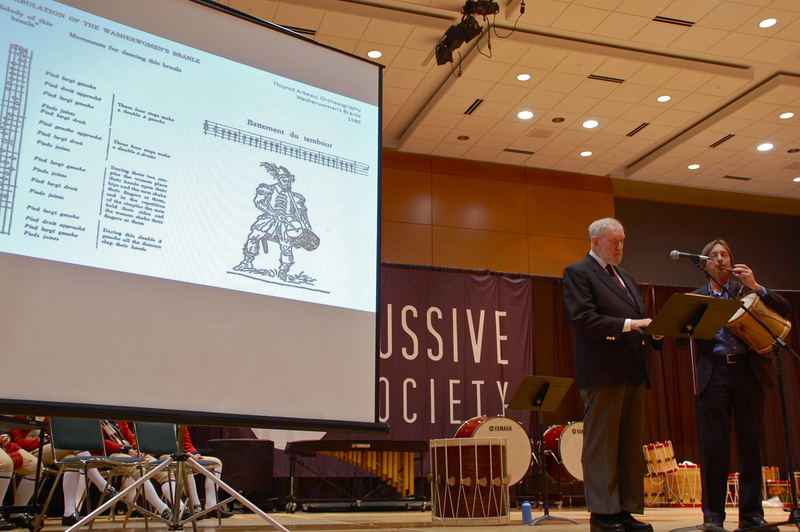 It was an historic DVD documenting the longest and most comprehensive concert of field drumming during the 41 year history of the Percussive Arts Society. It is really a treasure of drumming styles covering the American War for Independence, the Civil War, the veteran drum and bugle corps’s of the 20th century, Drum Core International and African-American Show Bands. Included were players who specialized in Swiss drumming, Fastnacht and Scotish drumming. 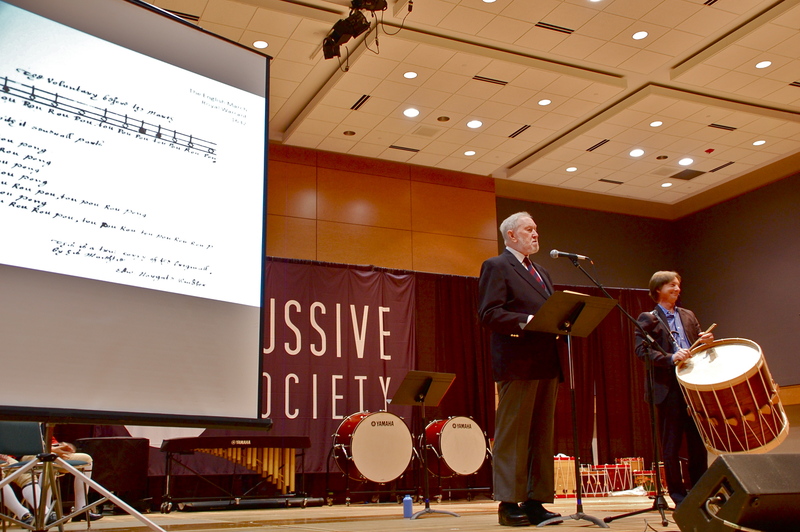 Finally after 9 years and serendipitously during the 50th anniversary of the P A S, the 1st Heritage Event took place. 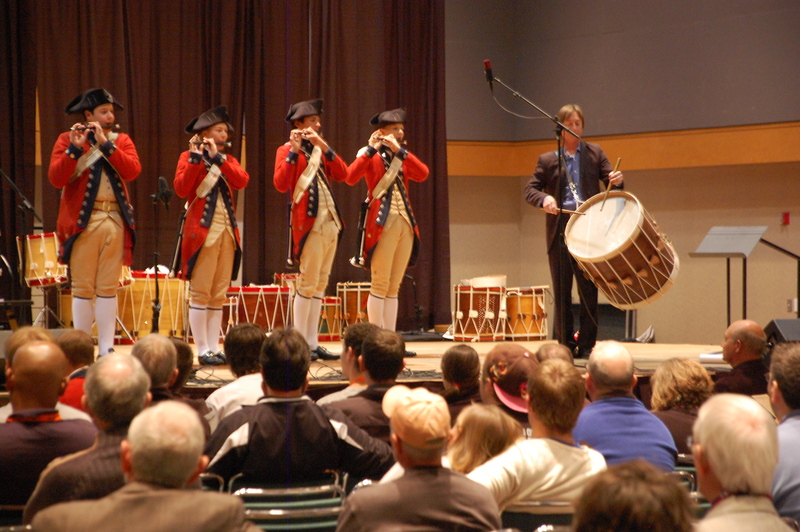 In 2002 Lance Pedigo and the Colonial Williamsburg Fifes and Drums opened the Drummers Heritage Concert. It was therefore fitting and proper for them to perform the first Heritage Event. 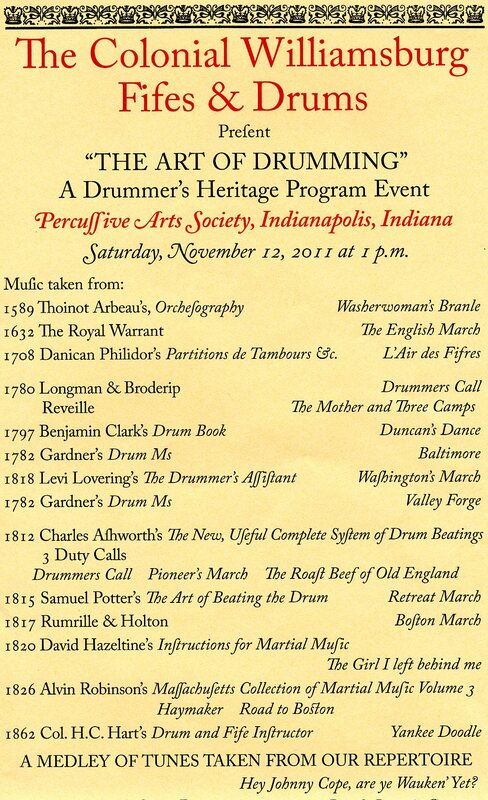 Lance had chosen the theme “The Art of Drumming” and had prepared slides which showed a a chronology of drumming techniques and music from the late 16th century to the 1861 Civil War in the United States. He also brought a Tabor and Pipe, a replica of a Renaissance drum and field drums of colonial American and Civil War dimensions. 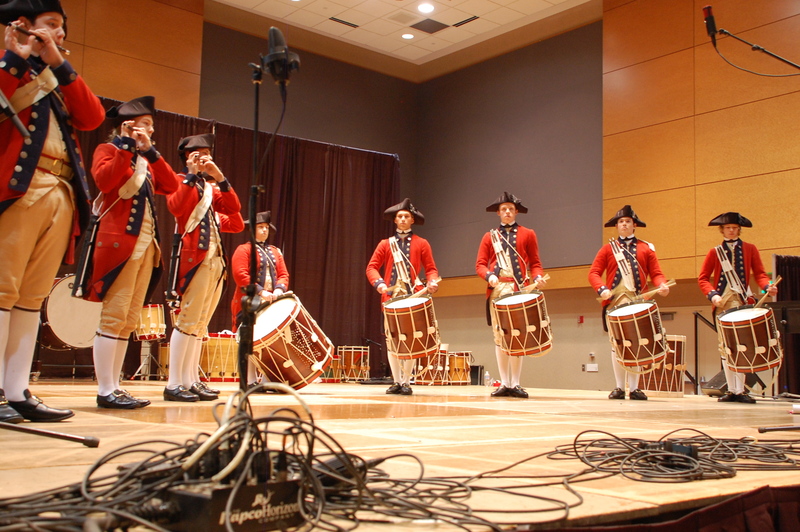 Four field snare drummers, a bass drummer, four fifer’s and a Drum Major represented Colonial Williamsburg, the Virginia State Garrison Regiment. It is important to point out that all of the colonial Williamsburg fifers and drummers range in age from 10 to 18 years. They cannot be accepted into the program unless they are unable to read music, play fights or drums. Long before they muster out, they will have memorized 150 tunes and drum beatings. The waiting list to join the core is many years. I have long admired the quality of Colonial Williamsburg players so an added special treat for me was meeting once again John C. Moon, one of the early Music Masters of Colonial Williamsburg and a dour, but knowledgeable Scotsman. Moon is the author of a number of books and no mean historian. He explained the famous “British March” on the Charles 1st (1625-49) Warrant and Lance played the beating as well as the Poing strokes that end each phrase. Though many scholars insist an accurate deciphering of this March is impossible today, Moon’s beating was convincing. The large PASIC convention room was almost filled to capacity. 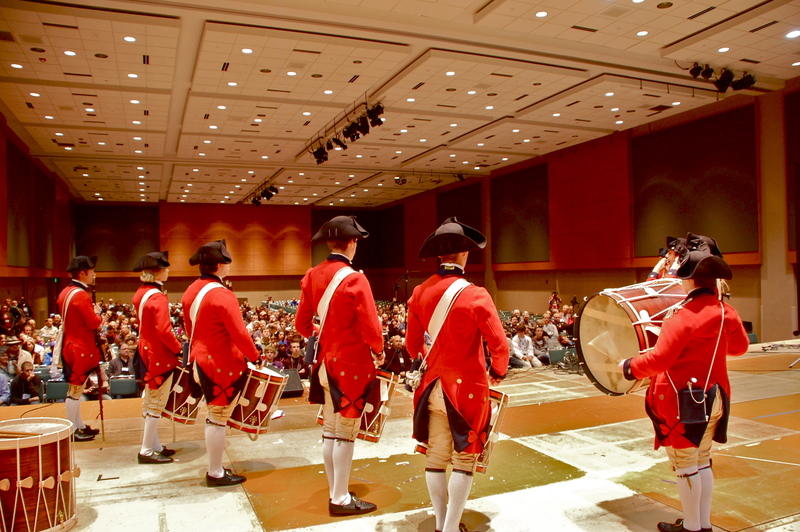 Since the initial Drummers Heritage Concert, the number of fife and field drum presentations and their audiences have increased substantially during international Percussive Arts Society conventions. To purchase the Historic Drummers Heritage Concert DVD and support future Heritage Events, please see below. All proceeds go to: PAS Drummer’s Heritage Concert Events Fund. All photos by R.E. Click on photo to view larger images. John C. Moon and Lance Pedigo. Pipe and Tabor music from Arbeau. Moon, Pedigo and the English March. Colonial Williamsburg Fife & Drum contingent. Thank you Robin for your continued work to perpetuate our “Drummer’s Heritage”.